. I was excited to receive a copy of this book signed by the author in the mail! 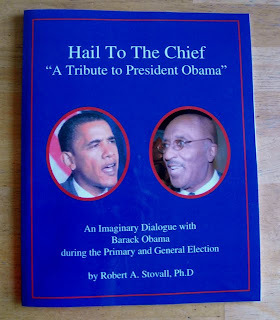 Published in 2009, the book has an unusual format; it presents an imaginary dialogue with Barack Obama during the primary and general election. 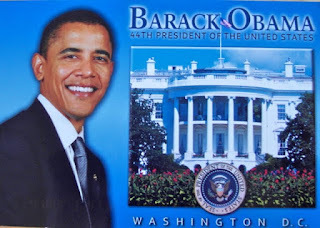 "The Voice" asks "Mr. O" penetrating questions, which President Obama, our first African American president, answers with his usual intelligence and eloquence. Ronald Reagan says to Barack Obama, "Well I guess it's alright - but, but I just don't know what to say to Nancy", and Richard Nixon says, "You 'tricked' them, didn't you? Tricky, tricky, tricky, tricky!!!!". Singer Marvin Gaye says, "What's going on? Somebody please tell me what's going on?" and The Temptations say (or sing) "We have got sunshine on a cloudy day". I think this would be an especially engaging book for students, which would lead to a lot of discussion, or anyone with an interest in great leaders. It's enjoyable to read, but at the same time it says a lot about racism, civil rights, and the hopes and dreams of the present and future. Dr. Stovall grew up in rural Mississippi and was a Los Angeles educator for thirty years. He's the founder and president of the Stovall Educational Uplift Foundation, a non-profit organization. Proceeds from this book will benefit the Stovall Foundation's Scholarship Fund. Special thanks to Robert A. Stovall, Ph.D and Bostick Communications for sending me this book. Congratulations on receiving a signed copy. It sounds like an interesting read. This looks like a fun read, and it's really cool that you got a collectible signed copy. I'd like to take a look at this book, it seems timely and entertaining. I would really like to read this interesting and imaginative book! Warren, thank you. It's always special to have a signed copy. Thank you, Zibilee. It's an important and entertaining book. Angie, I think you'd enjoy reading it. Thank you all for your comments. More comments are welcomed. That sounds like a really interesting read! very cool that you got a signed copy. this sounds like an interesting book! the fictional comments from past historical figures sound like fun.